If you’re having some deliverability issues, you are probably not alone. 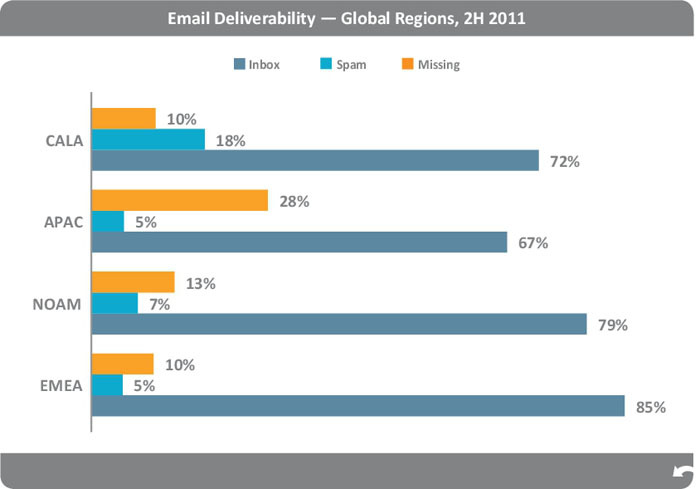 Email deliverability rate has dropped in the second half of 2011 according to Return Path. Calling it inbox placement rate, the percentage of IPR has dropped from an average of 80% (one in five has gone missing) to an average of 76,5% globally. This means almost one in four emails that has been sent has not been reported as delivered. One of the key reasons of the dropping deliverability rates has been the fact that ISPs are putting more weight behind reputation metrics and enforcing strict rules. It shows that inbox placement rates are highest in North America and Europe, Middle East and Africa while Asia Pacific and Central & Latin America sees the lowest inbox placement rates. With general email spam dropping a lot lately (from 300 billion to 30 billion daily), it seems that crowded inboxes due to commercial/spam messages are becoming a thing of the past. Have ISPs and webmail providers like Gmail, Hotmail and Yahoo tightened their spam filters too much? Have you seen a decline in your delivery rate? More people asking where the newsletter is you normally send? Or as an end user of for instance Gmail or Hotmail, have you noticed more messages ending up in the spam folder, even when they weren’t spam? It seems too much of a coincidence (I don’t believe in coincidence, but in this case…) that Gmail has posted an article on their official blog detailing the reasons why messages have ended up in your spam folder. Just over a month ago, Gmail has tightened their spam filters, with quite some messages not reaching the inbox anymore as a result, another post on Return Path’s blog tells.